While sports may be a good conversation starter, weather is universal and has no fan loyalties to offend. Like politics, all weather is local. No matter where we live, there is always some type of extreme condition that we can brag or complain about. Lying behind our claims to climatic woes are rather unobtrusive, and may I say, unglamorous instruments. Aside from elevating your prestige among neighbors, weather stations rarely garner much attention. for serious data collection for industrial users. On the other end of the spectrum, high-end systems are far beyond the abilities of the average industrial technician or wire-twister to install and operate. High-end systems are based on programmable data loggers that require an engineer to integrate the sensors and a developer to write a custom program to read the sensors, store the data, and relay it to servers where it can be downloaded, analyzed and viewed. Industrial safety requires a wide range of parameters to measure local weather conditions. Depending on the hazards, wind speed, wind direction, temperature, and humidity may be critical values. Such parameters are typically available on nearly every weather station, however, heat values and instruments such as globe thermometer, WBGT, heat index, humidex, and lightning detection may be parameters only available on mid-range or high-end systems. 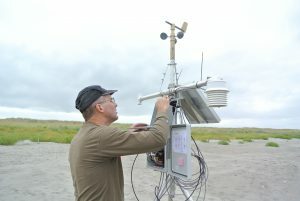 Environmental monitoring at construction, mine, material storage, waste management, and other industrial sites may use industrial weather instruments for dust or odor mitigation, supporting reclamation, validating or assessing regulatory compliance, and monitoring conditions such as evaporation rates, soil saturation, and wind gust effects. Unlike government-funded entities, industrial users must be sensitive to equipment purchase, installation, and maintenance costs. While a nod from the neighbor may justify the instrument screwed to your back fence at home, commercial and industrial users are looking for actionable data at a reasonable cost. Can existing staff support the installation and maintenance of the weather station? Does the purchase and installation require working with an exclusive dealer? What is the cost for ongoing dealer support and how do they schedule service calls? Is system configuration software free or is the purchase of a software license required? Is a subscription required to access the weather station data? Are software updates to the weather station free? Sensor operation can be an overlooked detail. The basic question is: Can the sensor capture the data of interest? Wind gust is one parameter that can be difficult to capture. Some equipment merely provides current or maximum values. This value may be sampled at an interval that does not allow for reliable gust detection or standard averaging techniques. Similarly, wind direction sensors may suffer from a dead-zone of three to five degrees. Manufacturers usually call this “north”, requiring the user to orient the whole system rather than merely setting the north position after installation. Equipment configuration should be simple and flexible. Special interface dongles, costly software, or complex programming languages are typically not desirable. A system that can be configured through both wired and wireless connections offers substantial service flexibility. Some applications may require connecting the weather station to automation controllers (PLCs) or SCADA systems. Interface ports, such as Modbus (explained in this post), allow for a direct connection using standard industrial hardware. A display, such as an LCD, on the instrument can be very valuable. A local LCD allows for operators to troubleshoot, configure, and maintain the system easily. This saves support cost and reduces configuration errors. For an industrial weather station to be worth the money put in, it needs to have wired and wireless features to deliver useful data when and where it is needed. Wireless data can be in the form of WiFi, cell phone, ISM-band radio, or satellite all having their own advantages and disadvantages. Stations with embedded cell phones may provide wireless data features as well as reports and configuration through SMS text messages compatible with any phone. Data accessibility should be a paramount consideration. If you can’t make sense of the data of interest, the system is useless. This may come in the form of charting historical values, condition reports on your cell phone, or a web portal. Software such as Weather View 32* and Weather Underground* are often used as means to review weather data. Our site of choice, Weather Underground, is a free web portal that beautifully charts instrument data and can be accessed by multiple users without any cost. Industrial weather stations are a step up in performance and features from the department store variety. While they may be more costly than consumer goods, you do not need to jeopardize your next performance evaluation. Hopefully this information will help you look beyond the wrapper and find a weather station solution that provides the versatility and flexibility that you need at a practical cost. * Weather Underground® is a trade mark of The Weather Company, an IBM company. Weather View 32 is a trade mark of Weather Information Systems.